Bagged and painted Echinacea ready to be cross-pollinated. In 2014, members of the Echinacea Project began a major effort to study mating compatibility in remnant Echinacea populations. Echinacea has a self-incompatibility system that prohibits self-fertilization and cross-pollination between individuals that share S-alleles (e.g. close relatives). We estimate population-level compatibility by randomly selecting focal plants from remnant populations and then choosing four individuals to donate pollen in crosses with the focal plant. The pollen donor individuals are selected to represent the variation in flowering phenology and distance between plants in the population–early and late flowering, near and far from the focal plant. To perform the crosses, we paint bracts of the focal plants to its pollen donor and exclude pollinators. The next day we apply pollen from the pollen donors to the newly emerged styles of the focal plant using a toothpick. On the following day, we assess style persistence as a measure of compatibility (methods are also described in Wagenius et al. 2007). Additionally, Team Echinacea occasionally investigates the comprehensive compatibility of a remnant population in a given year by performing all possible crosses between individuals in the population. Location: Remnant Echinacea populations in Solem Township. Read more about our study site. 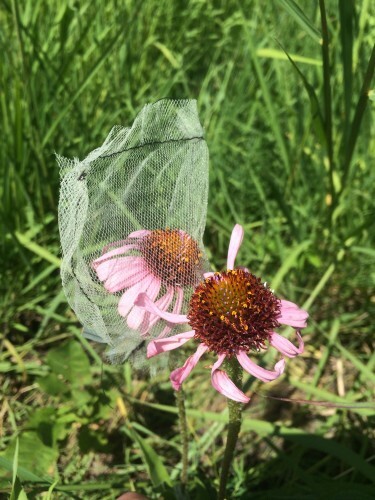 Link to flog posts: Read updates about this experiment on our flog (field blog) as written by members of Team Echinacea.